Easy pasta salad dressing. They’re an iconic summer barbecue dish, usually made from cooked pasta, an assortment of veggies, and a creamy mayo, or mustard based dressing. But, there’s no reason why pasta salads can’t be more inventive than that! 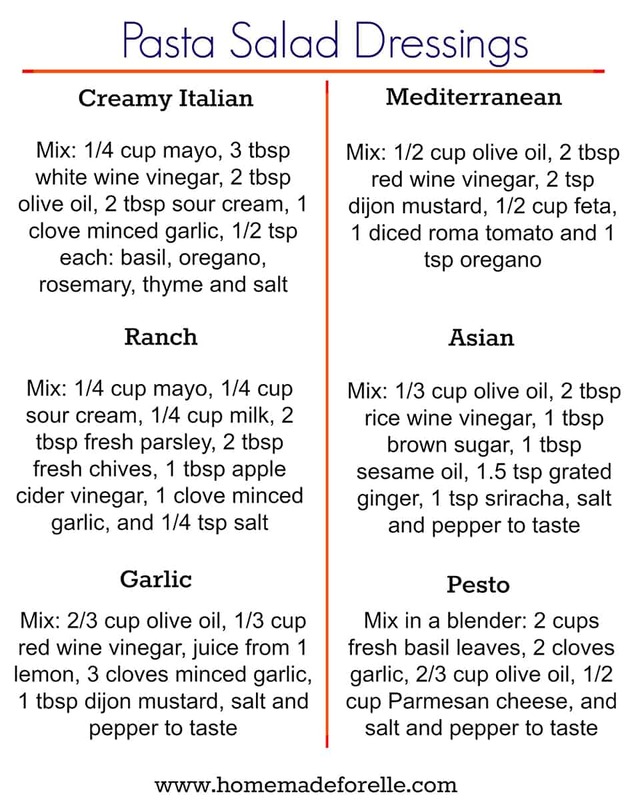 Below are 6 easy pasta salad dressing recipes to try out this summer! I happen to keep a large stockpile of various types of pastas: rotini, macaroni, bow tie, and even some animal-shaped pastas. I am not sure how I amassed such a collection, but I’ve been slowly making my way through it. Pasta salad is a yummy and inexpensive way to use up any type of pasta, and any veggies, herbs, and cheeses that need to be used up in your fridge. I wrote a basic tutorial on how to make pasta salad, from start to finish, customizing it to the ingredients in your home. It’s a great place to start! If you are craving more unique pasta salad dressing recipes, look no further. You should be able to find one here that will suit your tastes! I’ve also included a printable version below, in case you want to pin it, add it to your cookbook scrap book, or hang it on your fridge for easy access. 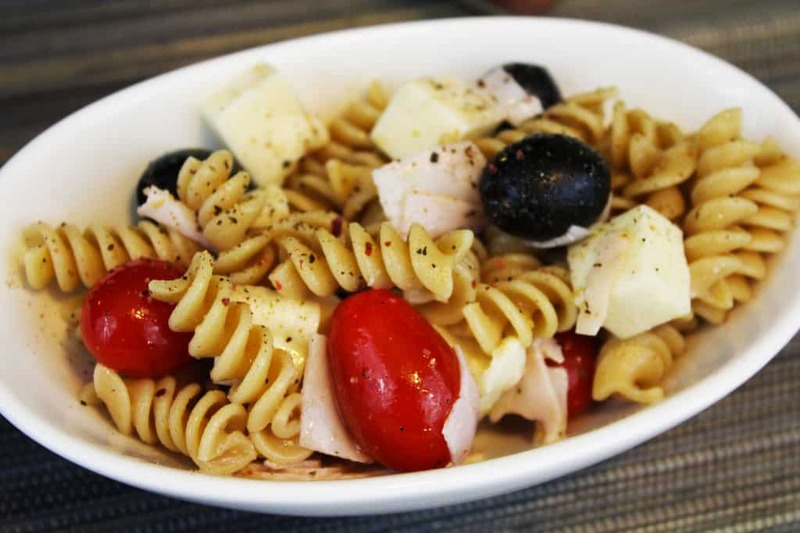 Pasta salad suggestions: Cooked rotini, black olives, diced tomatoes, diced pepperonis, and cubed mozzarella. Whisk together all dressing ingredients in a small bowl. Pasta salad suggestions: Cooked macaroni, crumbled bacon, diced red peppers, and shredded Parmesan cheese. Pasta salad suggestions: Cooked mini shells, cherry tomatoes, ricotta cheese and capers. Pasta salad suggestions: Cooked orzo pasta, diced tomatoes, and kalamata olives. Pasta salad suggestions: Cooked soba noodles, thinly cut zucchini and mushrooms, green onions and sesame seeds. Pasta salad suggestions: Cooked penne, diced onion, cherry tomatoes and shredded mozzarella. Making It’s that easy pasta salad dressing recipes is that simple! Once you get the hang of it, you’ll be creating your own easy pasta salad dressing recipes from your favorite ingredients, and making up your own recipes! If you’re looking for some more unique easy pasta salad dressing recipes, try these! To print out the image above, click here. Hello, Elle! I just wanted you to know how much I appreciate the 6 Pasta Dressings recipe. I have tried many home made recipes over the years so that I can control the salt content. As a matter of fact I don’t use any salt at all, but but the Ranch that I tried was perfect anyway! Thanks again and keep ‘um coming! I, for one, appreciate you, your time, and your effort. Thanks so much for the positive feedback, Patrisha <3 I am so glad you enjoyed the recipes! 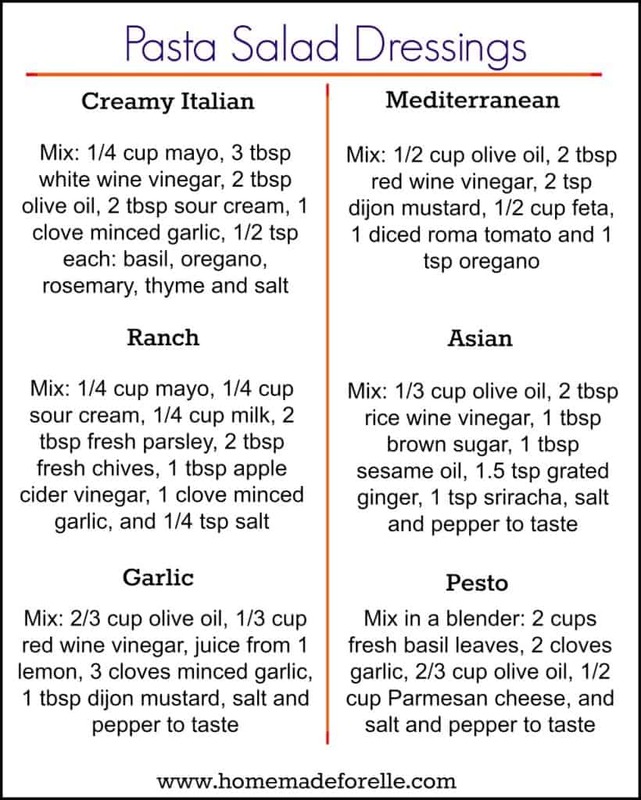 How much pasta is the creamy italian dressing recipe good for? I add it to a pound of cooked pasta, but I would recommend pouring in half, tossing it, and seeing if you like more, then if so — adding the rest.